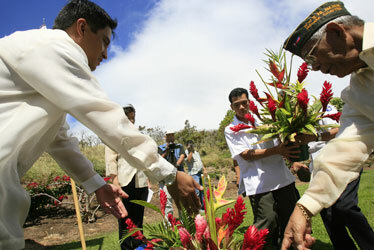 WWII veteran Artemio Caleda, right, and Philippine Consul Paul Raymund Cortes, left, directed where flowers were to be placed at the National Memorial Cemetery of the Pacific at Punchbowl Crater yesterday during a ceremony honoring the 65th anniversary of the fall of Bataan and Corregidor in the Philippines during World War II. Caleda was among 10 honorees who survived a 90-mile "death march." The image of a white flag doesn't symbolize weakness to Francisco Benigno, a Filipino World War II veteran. It means the opposite. Benigno remembers everything that came after the white flag -- the strength he and other Filipino-American soldiers needed to survive during the Japanese occupation of the Philippines. 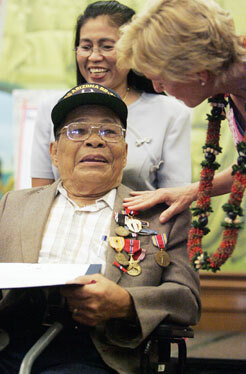 "I'm greatly honored," said Benigno, 88, of Kalihi. "I feel very happy today because I was one of those honored for their hardships of the war." Benigno, along with nine other veterans, received a medal yesterday during a ceremony at the Filipino Community Center to remember the 65th anniversary of the fall of Bataan and Corregidor. It was then that Filipinos fought as U.S. soldiers against the Japanese invasion of the Philippines. Without enough food or water, the U.S. surrendered the troops of Bataan to the Japanese on April 9, 1942. Since the Japanese could not provide transportation for all the prisoners of war, these soldiers went on a "death march," a walk of more than 90 miles to their prison. Benigno and the other nine veterans honored yesterday were survivors of that death march. 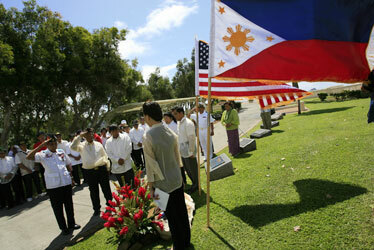 Filipino-American veterans saluted yesterday morning during the playing of taps at the National Memorial Cemetery of the Pacific at Punchbowl for a ceremony honoring the 65th anniversary of the fall of Bataan and Corregidor in the Philippines during World War II. The veterans were on hand to remember and reflect on the event, placing flower memorials on a placard dedicated to the soldiers who fought and died during that time. "Today, we turn back the pages of history so that we, our children, together can honor them and remember their sacrifices ... so that future generations can understand the tragedies of war like Bataan and Corregidor," said Eddie Agas*, chairman of the Philippine Celebrations Coordinating Committee of Hawaii, which sponsored the event. Veterans wore aloha shirts and barong tagalog, men's traditional wear made of lightweight fibers reserved for special occasions. Among those who attended the event were Mayor Mufi Hannemann, Philippine Consul General Ariel Abadilla and U.S. Ambassador to the Philippines Kristie A. Kenney. "I can't think of a more fitting place to commemorate extraordinary heroism of World War II than here in Hawaii," Kenney said. "It was the first part of the U.S. to suffer in World War II, and like the Philippines, it has gone on to rebuild and become a great part of the United States." John Dionisio Jr., who attended the event, said it is important for people to remember the veterans while some are still alive. Dionisio's father, once the Philippine consul general in the late 1950s, told him the importance of the soldiers in Bataan and Corregidor for Filipinos in American history. "Filipinos were just neighbors to Americans," Dionisio said. "Bataan and Corregidor changed the relationship between Filipinos and Americans. Americans knew that the Filipinos fought back against the Japanese, and Filipinos earned their respect." Manuel Pablo received a Philippine Liberation Medal yesterday from Kristie Kenney, right, U.S. ambassador to the Philippines, during a ceremony at the Filipino Community Center. Behind is Pablo's wife, Fely. » Eddie Agas is chairman of the Philippines Celebrations Coordinating Committee. A story on Page A3 in yesterday's morning edition misspelled his last name as Argus.